The $75,000-added Let It Ride Stakes, a one-mile contest over the infield Jimmy Durante Turf Course, will match seven three-year-olds Saturday, launching a three-day weekend of Thoroughbred racing action climaxed by a special Veterans Day program Monday at Del Mar. Headlining Sunday will be the $100,000 Betty Grable Stakes for older fillies and mares at seven furlongs while the $100,000 Desi Arnaz Stakes, also at seven furlongs, for two-year-olds, will top the card Monday. Post time is 12:30 p.m. for all three days. Multi stakes-placed Afleet Ascent and Calexman figure to be well-supported in the wagering as they face Prince Earl, Choo Choo, Risky Proposition, Extraordinary Jerry and Fight One. Afleet Ascent, to be piloted by Hall of Famer Kent Desormeaux, comes into the Let It Ride from an allowance victory at Santa Anita sprinting on the grass. 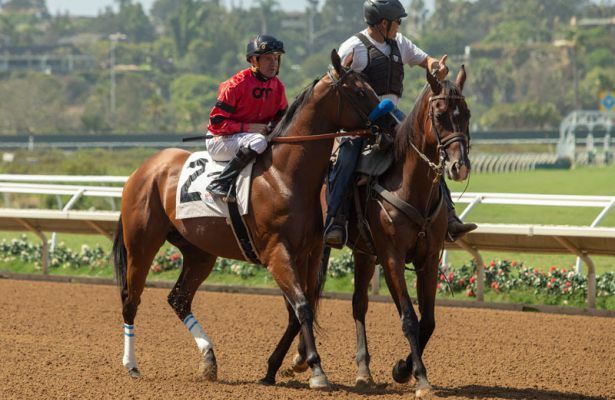 Prior to that performance, he was runner-up in both the Shared Belief, to Tatters to Riches, and the Oceanside, to Restrainedvengence, at Del Mar. Calexman, fifth to Afleet Ascent in the aforementioned turf sprint at Santa Anita, was third behind the classy River Boyne in the La Jolla Handicap and third in the Oceanside. Geovanni Franco has the call on Calexman. Choo Choo, with Flavien Prat to ride, hasn’t run since May 5, but he won the California Derby last January. Unbeaten in two starts and making his stakes debut will be Prince Earl, with Drayden Van Dyke scheduled on board. Prince Earl scored going a mile over the Del Mar grass in early September. Completing the field will be Risky Proposition, with Joe Talamo; Extraordinary Jerry, Mike Smith, and Fight On, Rafael Bejarano.